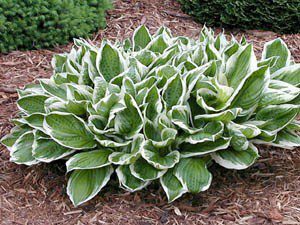 The albomarginata is one of the more popular varieties of hosta. You’ve probably seen it in many landscaping projects, if not in your own yard. This variety is known for its compact size, pointed leaves, and crisp white edging. This plant’s height will reach between 15 and 18 inches. Its width is usually between 18 and 24 inches. When planted in half sun/half shade or full shade, it will take off with very little maintenance. Over time, this hosta will multiply, making it a great addition for naturalized landscapes. The albomarginata blooms from mid to late summer. Its light lavender blooms add a subtle pop of color to borders, flower beds, and other landscaping features. The blooms will also attract hummingbirds and butterflies. Plant it near windows or doors so you can observe the wildlife all summer long.